Vandegrift High School, Four Points Middle School and Zuma Office Helping To Feed Hungry Central Texans! Vandegrift High School and Four Points Middle School, in partnership with ZumaOffice.com, had another incredible holiday food drive supporting the Central Texas Food Bank. The 5th Annual event collected 2,757 lbs. of food for hungry Central Texans at a time when the food bank has an increased need for donations. Since the food drive’s modest beginnings in 2012, over 11,000 pounds of food equaling 9,269 meals has been collected. 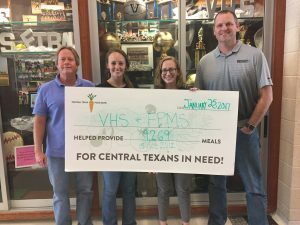 Cliff Ellis, head coach of the Vandegrift High School Boys Basketball team, April Dang, team Mom, and Greg Pierce, founder of office supplies company ZumaOffice.com, came up with the idea for a food drive when Coach Ellis was looking for a way for the team to give back to the community. The key to the food drives growth was including Four Points Middle School in the event in 2013. The efforts of FPMS, led by Coach Hope Todd, have been nothing short of amazing always accounting for over half of the total donations. The school uses friendly competition between the grades to encourage student donations, and the results speak for themselves. This entry was posted in Office Supplies and Charities and tagged Central Texas Food Bank, office supplies that give back, Vandegrift High School, Zuma Food Drive, Zuma Office Supply. Bookmark the permalink.